It's Q&A Tuesday, where I answer your questions about self/marriage/career/life/whatever-improvement. If you have a question, be sure to submit it! On to this week's question. "What's the best way to organize my time?" The answer to this question is the same as the answer to "What is the best diet? "...The one that you'll actually do. The most important aspect of time organization is that you do it. As long as you're thinking about your time and how you should use it, you can't go wrong. Now if you're detail oriented you can develop a system where you plan out your day to the minute based on your goals and priorities, and then do a nightly evaluation and planning meeting. You could have everything you need to do sorted by due date and importance. You could have charts, lists, and reminders with you at all times. You could also have weekly, monthly, quarterly, and yearly planning meetings for short term, mid range, and long term goals. If that sounds like WAY too much work and you'd rather not spend all your time planning how to use your time, maybe a simpler system would be right for you. If you know there's a couple hours every day when you watch TV just because there's nothing else to do, you could make a simple plan for those two hours. At the beginning of the week jot down a few things you need to do or would like to do. Then work on that list during those two hours. BAM! In only a few minutes you have a plan to use your time more wisely. Unfortunately, most of us have a problem with not enough time, and not what to do with our extra time. This is where prioritization becomes really important. I like the system described by Stephen Covey with his Urgent/Important Matrix (example below). It divides up things we do into Important and Urgent, Important but not Urgent, Urgent but not Important, and neither Urgent nor Important. The boxes are labeled based on priority. To be productive we should spend most of our time in box 2. Occasionally something urgent will come up, but since we take care of things before they become urgent, only unexpected things should be in this box. If you spend all your time in box 1 you're constantly putting out fires due to poor planning. If you live in box 4 you're someone who tends to look for any reason to not be working. I know in college I spent a lot of time in box 4. To avoid homework, I'd get on Facebook, get something to eat, or just stare out the window. 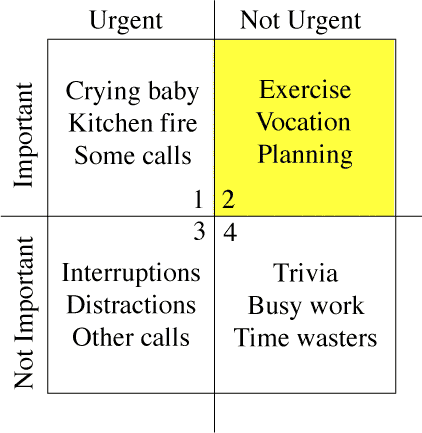 If you live in box 3 you are in a hectic environment and need to delegate responsibility or set clear boundaries so you can get some work done. 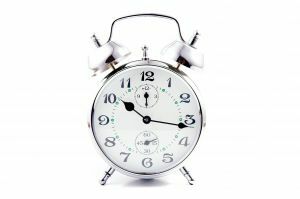 If you look online you can find a lot of resources on time management. You could also pick up Getting Things Done: The Art of Stress-free Productivity by David Allen from your local library. Try out some systems and then when you find one that works for you, stick with it. Consistency is the key.